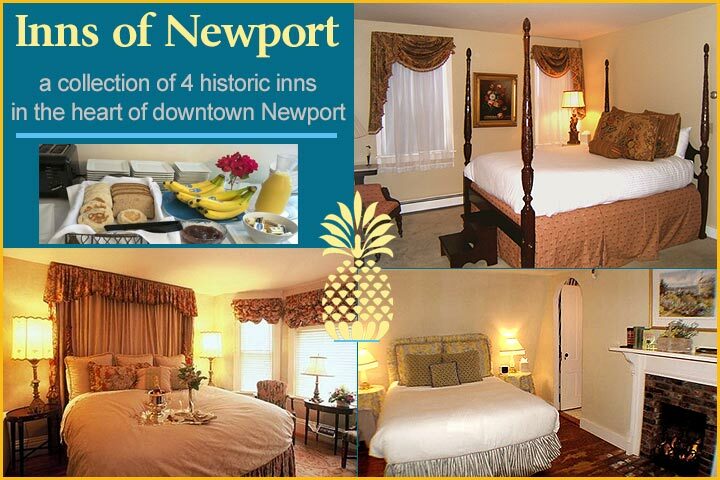 A selection of historic inns located in the very heart of Newport, just a couple blocks from downtown wharves, shopping, dining and nightlife. Whether quaint and cozy or large and steeped in history, inns can make your accommodations a real integral part of the total vacation experience. Newport RI has a great selection of beautiful inns, that range from large converted single family homes to large victorian estates featuring sweeping front porches, period furnishings and decadent gourmet breakfast service. Virtually all rooms feature a private bath, and some offer additional services as well. The real advantage to staying at an inn are significant: Many of Newport's inns are converted single family homes from the 18th, 19th and 20th century, letting visitors discover a part of Newport's history and charm. Also, if you crave that one-on-one personal service, an inn offers the intimacy of a home combined with the services of a larger boutique hotel. With Newport's vast collection of early American homes, it contains more options in this category than many other destinations, and exploring the building itself and its history can be fun experience. Lastly, many of Newport's inns are located within walking distance to town, making it a convenient and central place to be located during your stay. Newport's small and winding streets get VERY congested, and exploring the town on foot is much easier than attempting it in a car. So consider staying at an inn on your next visit. It can be an experience that you will treasure for many years to come.